Force Vitale is a complete line of highly advanced botanical skin care products which addresses the specific needs of all skin types. It is positioned as a sophisticated problem-solving regimen and is suitable for all ages and skin types. From daytime protection to evening revitalization, this ultra luxurious line provides targeted care to visibly improve the skin’s texture and overall appearance. Highly Effective Formulas. 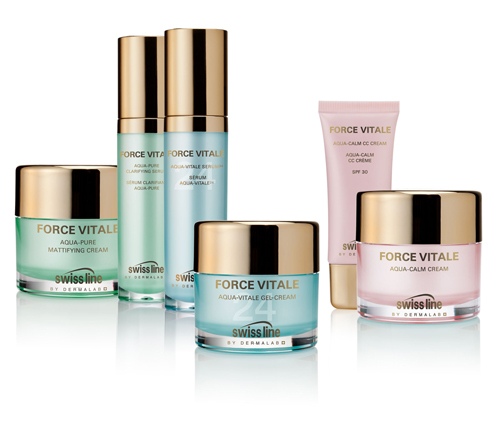 What makes the Force Vitale collection unique, is the combined benefits of three powerful Swiss Alpine Plant Extracts, plus other clinically tested Botanical Complexes. Growing at high altitudes in the pure air of the Swiss mountains, these plants are a rich source of natural ingredients. Swiss Line Force Vitale Bloom Flash - New!